The cheetah is the fastest animal on earth and a very unique cat. Living in hot and arid areas of Africa and with a small population in Iran, they hunt gazelle, rabbits and immature zebra and wildebeast by stalking to within 30 to 50 yards and then running them down with blistering speed. Like a Formula One race car, the cheetah is built for speed, with a deep narrow chest and lungs, huge heart and wide nostrils. Their claws do not retract, and are always extended providing extra traction, and the extremely long and flexible tail is used as a rudder for aid in changing directions. Male cheetahs are the more social, spending most of their lives in small groups called "coalitions", while females live with their youngsters until they are independent and rarely associate with adult cheetahs other than for brief breeding encounters. Quicker off the mark than a Lamborghini, the cheetah is the fastest animal on Earth, capable of going from a dead standstill to sixty miles per hour in 3 seconds. If need be, they can maintain 70 miles per hour for the length of 10 football fields before they overheat and must stop. Hunting by sight they will choose a gazelle, rabbit or young wildebeast and than run the target down, tripping it with a paw swipe or a body check and closing the deal with a choke hold. After the extreme acceleration however, the cheetah, exhausted, with its massive heart pumping at over 170 beats per minute, must rest and cool down. The female cheetah is "poly estrus", meaning she will come into heat more than once a year. She will ovulate every 3 to 4 months until she is impregnated. While in estrus female cheetahs will mate with multiple partners but they don't stick around for more than a couple of days. A cheetah pregnancy lasts about 90 days. Before she is ready to deliver, the expectant mother will scout out multiple safe dens for future use. She will settle in a den and give birth to as many as 6 cubs, although 3 or 4 is most common. The first 3 months of the little cubs lives is a dangerous time because she must leave them alone while she hunts. 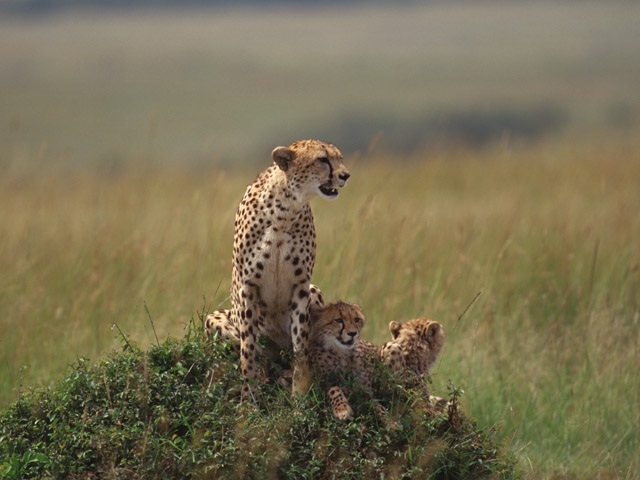 Raising a family on her own, the mother cheetah is tireless, fearless and cunning. She waits till the hottest part of the day when other predators are snoozing in the shade, to transport her youngsters one at a time from den to den. Every two or three days she will find a new hiding spot. When the cubs reach about 3 months they are finally old enough to travel with her. At 4 months they will start to stalk and hunt and will be taking down prey successfully by 10 months. 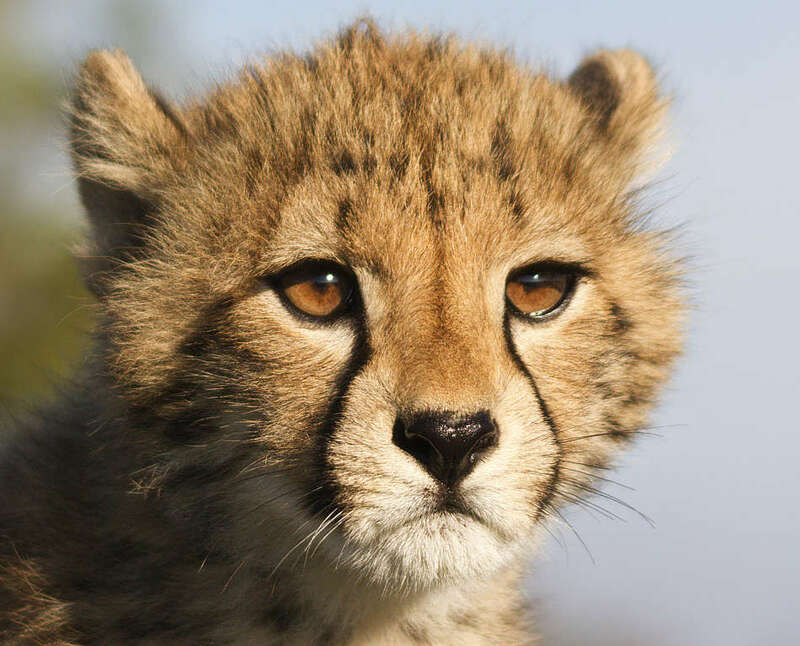 The average cheetah has round, black spots distributed fairly evenly across its tawny colored coat, and of course the famous black "tear streaks" down either cheek, but a rare color mutation exists that was once considered a separate species. 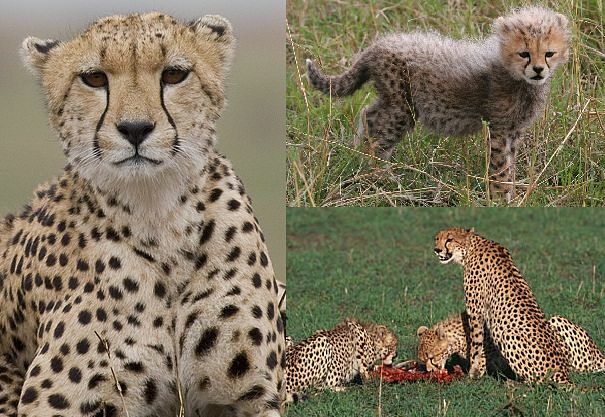 King cheetahs are the result of two parents with the same recessive gene coming together, and they may occur side by side with normally colored litter mates. The King cheetah has large splotches instead of spots, the field color is sometimes pale or almost white, and there are thick black stripes down the back. 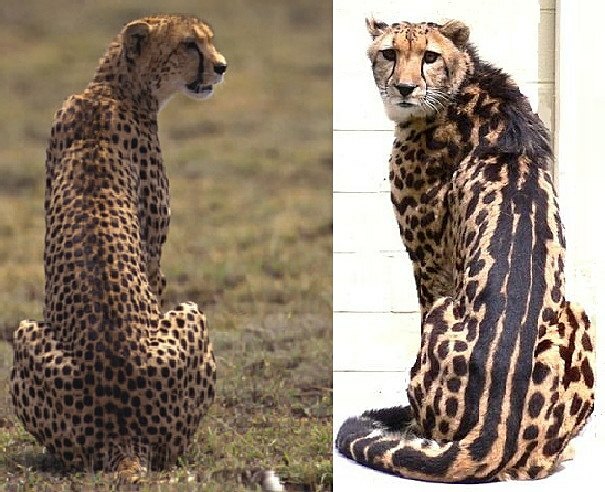 In addition to the difference in markings, the King cheetah also has a mantle of long black fur on its shoulders. Extremely rare in the wild, and not even photographed until 1975, several have been bred in captivity with the discovery of the recessive gene. After the first eighteen months of life spent with her mom and siblings, female cheetahs head off to live, hunt, mate and raise young all on their own. 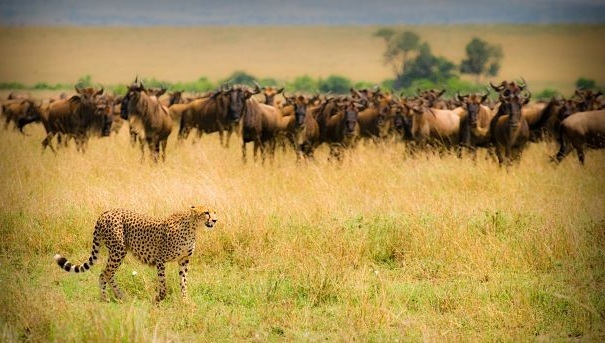 In a life pattern vastly different from other animals, male cheetahs will remain in very social groups of 2 to 6 usually related males called "coalitions" their entire lives. 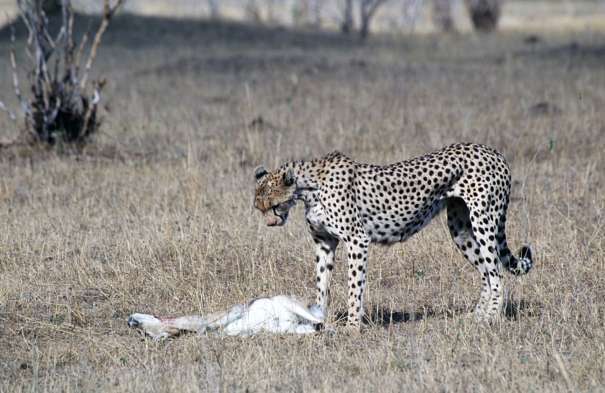 Cheetahs use the "chase-trip-bite" hunting method, using one front paw to send their prey into a tumble and then killing with a strong squeeze of the neck.. 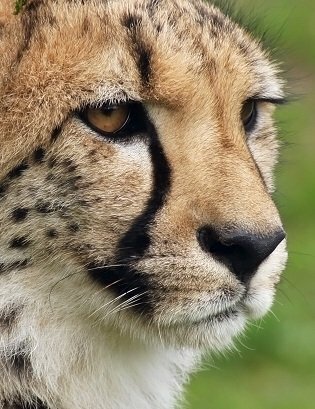 The average cheetahs top speed is probably about 65mph, with some exceptional individuals reaching up to 70mph for no more than 3-4 seconds. 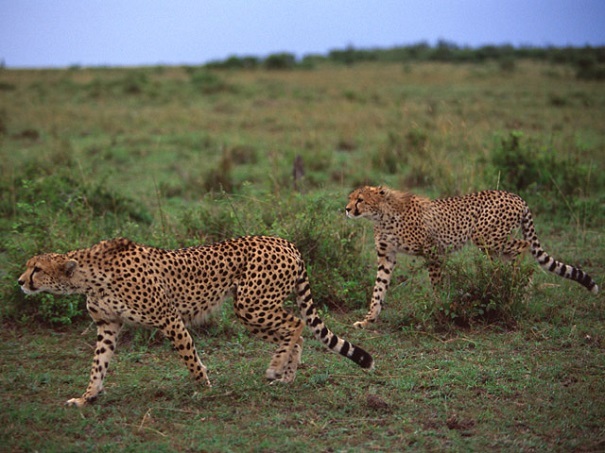 The cheetahs extremely flexible spine is the main reason it is so much faster than other speedy animals. You will never see a horses spine curved as in the cheetah sprinting photo. The cheetahs famous black "tear-streaks" may reduce glare like a football players eye-black. The 4 to 5ft long cheetah has a 20ft stride - Amazing! 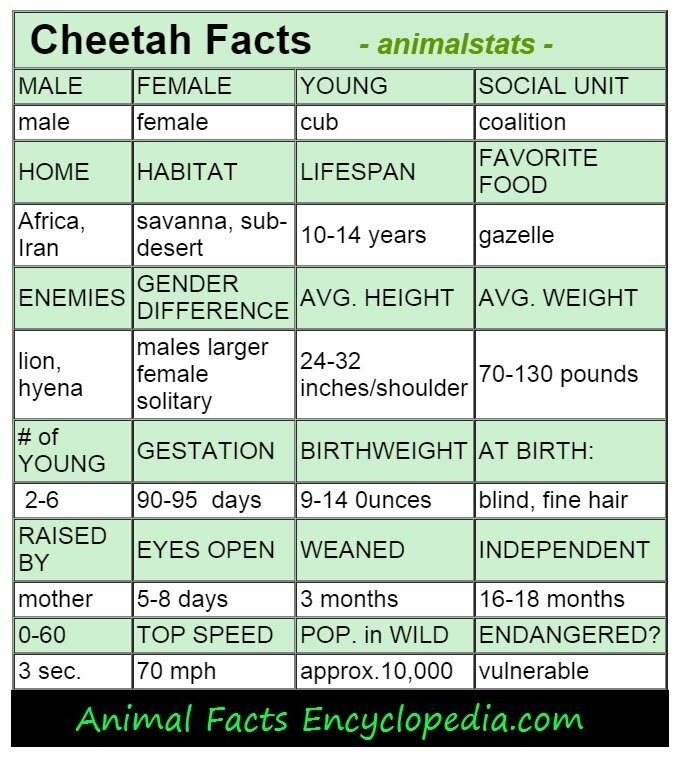 The cheetah is not considered a "big cat" because it is not a member of the genus panthera, and it lacks the physical ability to roar -Cheetah Facts! 0-60 TOP SPEED POP. in WILD ENDANGERED?